Be permissive as regards the initial distribution and installation of software, but withdraw (or “revoke”) these permissions if it becomes clear that the software has bad effects. Any attempt to make the tests more reliable will introduce unacceptable time delays and cost. The best that an application checking system can hope to accomplish is a quick sanity test – to spot significant errors. Inevitably, this means that some bad software will slip through the system. As a result, any anti-malware system on mobile phones needs to consider at least some revocation component. In yet other cases, the developer who signed the application could be barred from signing any more applications – this could be appropriate in cases where the developer has been caught out making pirated zero-cost versions of commercial software. This picture is attractive. However, we need to be aware that it relies on the existence of a “revocation infrastructure”. One part of this infrastructure is the reliable identification of an application. This is accomplished via tamperproof digital signing. However, this is only the start of what’s needed for revocation to work. It was because of the lack of a developed revocation infrastructure that the original Symbian Signed scheme followed route 1 above – Put the main focus on checking and testing software (and the originator of the software) before it is allowed to be distributed or installed – rather than route 2 – Be permissive as regards the initial distribution and installation of software, but withdraw (or “revoke”) these permissions if it becomes clear that the software has bad effects. Software that deliberately or accidentally broke PlatSec partitioning of processes & data could disable the revocation check. Some applications that run without problems on some networks may cause problems to other networks; does this mean that revocation may need to be specific to individual networks? Some application writers may seek to contest decisions to declare their software as malware. I’m not saying these issues are insurmountable. There are candidate solutions for all these issues. But I do want to point out that revocation has its own costs. My own view nowadays is that even a partially working revocation would probably still be a better system than the current reliance on centralised testing of applications before they can be distributed. By “partially working revocation” I mean a system that works by community reviews. Users who notice problems with applications would be encouraged to publicise these issues, so that the community as a whole can weigh up the evidence. Popular application stores would take this information into account in the material provided to describe the applications available for download. If an application is subsequently deemed to be problematic (on, say, particular phones), then relevant users would be sent messages alerting them of this situation. In some ways, this premium service would be akin to the anti-virus monitoring solutions that are already available from some security specialist companies – although the implementation mechanism would be different. Note finally that I’m not advocating opening all functionality to all developers, without any vetting. I believe that functionality such as AllFiles, DRM, and TCB, still needs to be carefully controlled, and cannot fall under a system of “use until revoked”. One argument in support of this view has already been mentioned (point 6 in the list above of issues with the mechanics of revocation). That’s the Symbian description of the practical importance of passion. 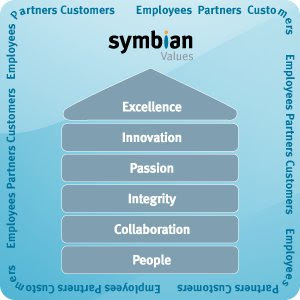 Along with people, collaboration, integrity, collaboration, and excellence, passion is one of Symbian’s six declared corporate values. Like many other companies, Symbian each year carries out an internal employee satisfaction survey. The survey is conducted by an external agency, who provide us with information on how our results compare with broadly similar surveys held by other high-tech companies. In the most recent survey, aggregate Symbian employee views demonstrated strong Passion (80% positive rating). Of the six values, this one had the strongest support of all. The score also came in notably higher than the benchmark. In general, our employees enjoy working here, and put their hearts into their activities. In some ways, “passion” is a longer word for “fun”. The good news is that, on the whole, Symbian employees enjoy and value their work. The bad news, however, is as I covered in my previous blog posting, “Symbian, just for fun“: many developers outside the company have a less positive feeling about working with Symbian OS software. They may persevere with writing Symbian OS software because their employer pays them to do so, and because of the somewhat attractive prospect of a share in a growing 200M+ unit market, but they often lack the kind of inner motivation and satisfaction that can put them into a super-productive state of “flow“. The encouraging responses I’ve received to that posting (both via email and online) stengthen my view that it’s vitally important to identify understand the inhibitors to developer flow – the killers of Symbian passion. That’s a big topic, and I suspect I’ll be writing lots more on this topic in the months ahead. But let’s make a start. Ilgaz wanted to use a particular third party application (Y-Tasks by Dr Jukka), and thought that it would first need to be signed with a developer certificate. That proved to be an awkward process. However, it turns out that the application is ready to use (for many purposes) without any additional signing. So the attempt to get a developer certificate was unnecessary. A small number of people seem to be motivated to spread particularly bad vibes about Symbian Signed. Avoid a divergence of implementations of different application approval schemes by different network operators. It’s my profound hope that the attractive statements of common aims of openness, made by the various parties supporting the Symbian Foundation, will translate into a unity of approaches towards application approval schemes. Getting people to develop apps just for fun is one thing, but getting them to hack the actual OS is another thing. For that to be of interest, there have to be open devices available, so that the developers can actually see their code running. I agree with the importance of quick feedback to changes made in your software. If you change the lower levels of the software, you’ll need to be able to re-program an actual device. The Linux community shows the way here, with the Trolltech Greenphone and the FIC OpenMoko Neo1973 and FreeRunner devices. It’s true that there have been issues with these devices. For example, Trolltech eventually discontinued the Greenphone, and the FIC devices have proved quite hard to purchase. However, as the Symbian Foundation software becomes increasingly open source, we can reasonably expect the stage-by-stage appearance of phones that are increasingly end-user re-programmable. One of the main things mobile developers would want to do is make use of the unique features of a mobile phone (connectivity, built in camera, physical interaction with the user). However, it is those area where documentation is still most patchy and API support is erratic (CCameraAdvancedSettings anyone?). True, many “fun” programmers (me included) don’t want to wade through tons of documentation and whitepapers before writing their first proof-of-concept – but to me this makes it even more important that the existing documentation is streamlined, accurate and compact. Improving our developer documentation remains one of the top-priority goals at Symbian. In parallel, we’re hoping that additional publications from Symbian Press (and others) will help to guide developers more quickly through the potential minefields of APIs for the more interesting functionality. The book “Quick Recipes on Symbian OS” (which I mentioned at the end of an earlier posting, “Mobile development in a hurry“) is intended to address this audience. Of course, as Simon Judge points out, sometimes it’s not a matter of improving the documentation of existing APIs. Sometimes, what’s required is to improve the APIs themselves. The ad-hoc-ish nature of the S60 UI, which seems to require a lot of experimenting and guesswork for developing even very simple screen layouts that mimic closely what is already present in the phone in dozens of places. Even after years of development, I still consider the CAkn and CEik listbox classes a jungle. However, the bigger point is the following: both Symbian and S60 have recognised for many years that the separation of the two software development teams into two distinct companies has imposed drawbacks on the overall design and implementation of the APIs of functionality that straddles the two domains. Keeping the UI and the OS separate had some positives, but a lot of negatives too. Assuming the acquisition by Nokia of Symbian receives regulatory approval, the resulting combined engineering teams should enable considerably improved co-design. The new APIs will, hopefully, inspire greater fascination and approval from those who use them!